Premium A3 Art Tray Units available with 6, 8 or 10 trays, with Gratnells plastic art trays in a mobile wooden carcase. 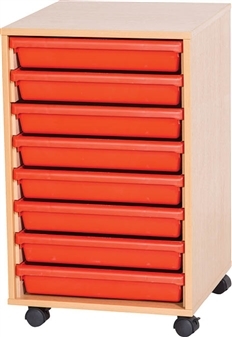 The plastic art trays come in red, blue, yellow or green, and are ideal for storage of art and craft paper and materials. 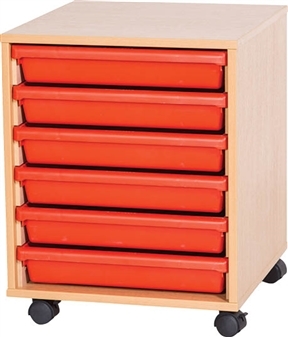 These storage units are ideal furniture suited to the school, classroom, and other educational environments, and may also be used at home, in the office or workshop. The units come fully assembled and come in a durable, wipe-clean, scratch resistant laminate finish in a choice of 5 wood finishes - beech, maple, oak, grey & white They come with a 5 year guarantee.